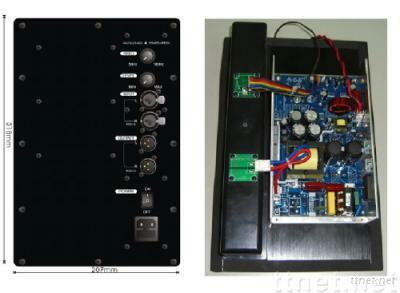 HD-1408PA is 400W/8 Ohm digital subwoofer power amplifier. It is for active Public address (PA) subwoofer system. Due to digital amplifier and switching power supply design, it ?s high efficiency and weight becomes lighter than traditional analog amplifier & liner transformer design. 1. Digitalize amplifier with high current output device. 2. Left and right channels female XLR jack input. 3. Left and right channels male XLR jack Output. 4. Low pass frequency controls (40Hz~180Hz / 24dB / Oct). 5. Subwoofer volume controls. 6. Build in anti-clipping circuit. 7. Output short / thermal / DC offset protect circuit. 8. Red color LED for power on indicator. 9. AC inlet with fuse holder.